Info "Hey, batter batter batter..."
Swing Batter is one of Jimmy T.'s microgames in WarioWare: D.I.Y. The game is based on the sport of baseball. The point of the game is to hit the baseball with the bat. The pitcher will throw the ball either normal, slow or fast. 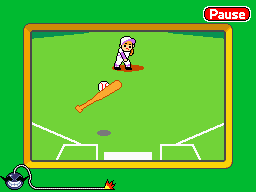 The player can tap anywhere on the screen to swing the bat, though it can only be swung once. If the bat manages to hit the ball (while it is red), the text "Home Run" flashes on-screen, and the game is won. However, if the player misses the ball (after it turns gray) or the bat is swung too early (while it is still white), the game ends in a loss.